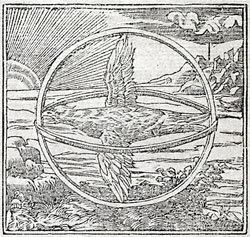 Alciato at Glasgow: Emblem: Remedio de Amor. De echizo ni de Amor seras herido. De que a’l momento no estè remediado. 1. These lines describe the rhombos, a device used in casting love-spells. The bird usually employed was a wryneck, associated with Bacchus, possibly because of its dappled markings. (Cf. the dappled fawns associated with the god.) The wagtail seems to have been confused with the wryneck in folk belief. 2. Jason was helped in the tasks imposed on him by the king of Phasis, by the sorceress Medea, daughter of the king. Instructed by Venus, Jason used the rhombos to cause Medea to fall in love with him and so use her spells to help, not harm, him. See Pindar, Pythian Odes 4.216ff.